Think of Exeter and think of minibuses. However there is much more to this fair Devon city than converted bread vans. Exeter Corporation operated till the late 1960's when it was absorbed by the local NBC company, Devon General. Classic AEC and Leyland half-cabs gradually made way for standard Bristol VRs and Leyland Nationals. Devon General was split off from its parent Western National in the mid 1980's and was privatised soon thereafter. The minibus revolution continued under Thames Transit control until almost all services used them. Then suddenly Devon General was sold to Stagecoach in the early 1990's. Small sized buses returned to rural operation, local express services were re-branded Stagecoach Express and recently double-deckers are back in favour. Local business is rapidly expanding in Exeter and this is reflected in updated city services and additional park and ride facilities. Even the minibuses are bigger and better. 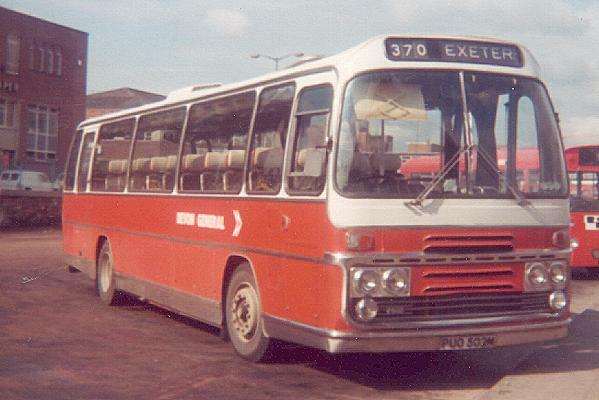 Exeter Corporation ran the city services for many years. Some of the vehicles such as Leyland half-cabs (top right) and imposing AECs (bottom right) survived well into NBC days. Devon General also had some stylish, if somewhat more modern, vehicles such as this Atlantean (left). Harry Blundred, the manager of Devon General, started the minibus revolution in the UK. Overnight a group of city routes were converted from double-deck to minibus operation (top right). The chosen vehicles were Ford Transits with extremely small seating capacities, which were colour-coded to help with route identification (above). These were soon replaced by larger Mercedes minibuses, which were also used on rural routes. When Stagecoach assumed control, the fleet was gradually updated with long gravity-defying Varios now providing the backbone of the main city services (right). There are several local express connections from Exeter to nearby towns and cities. Stagecoach provide regular links to Torquay, Plymouth (left) and Newton Abbot (above left). First recently upgraded their services to Bude and Newquay (above) by re-branding them under the Excel banner. They also operate the X53 to Weymouth using new standard Scania single-deckers. Exeter has a regular service to London (operated by Parks/Trathens) and Bristol. The well established overnight service from Penzance to Edinburgh also calls (above left). Formerly these services would leave from the adjacent Paris St. coach station which would fill to capacity every summer Saturday lunchtime when all sorts of unusual coaches would make guest appearance (above right). Many of the rural services around Exeter are operated commercially, which probably explains why so few independent operators find themselves in the city bus station (upper right). Originally these routes were provided by full-size vehicles such as small Bristol LHs (lower left and middle) or larger Leyland Nationals (lower middle) and Bristol RE's (lower right). These were eliminated by the minibuses, but Stagecoach has now restored some order with Dennis Darts, some with cute baby Alexander bodies (upper left). Only in Exeter do double-deckers deserve a special mention. A threatened species until recently, in the 1980's only a handful were owned (left), but now Stagecoach has started cascading Scanias, Tridents and Olympians (right) from London. 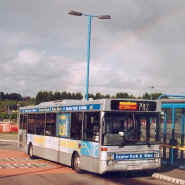 Exeter provides several park and ride services operated by a variety of vehicles such as ex-Hong Kong darts as seen above. Stagecoach Mercedes minibus N734RDD south of Exeter in November 2003. 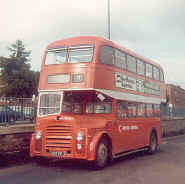 Devon General 537 (NDV537G), an MCW/Atlantean at Exeter depot in May 1984. 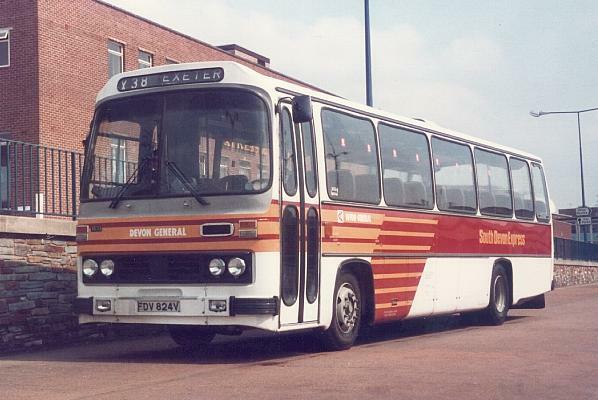 Devon General Massey bodied Leyland PD2 482EFJ in Exeter bus station in July 1978. Devon General AEC Regent V 512 (CTT512C) in Exeter bus station in July 1978. Devon General minibuses in Exeter including 730 (C730FFJ) in May 1987. Stagecoach Alexander Vario bodied Mercedes 42118 (S118JFJ) at Exeter St. Davids rail station in November 2003. 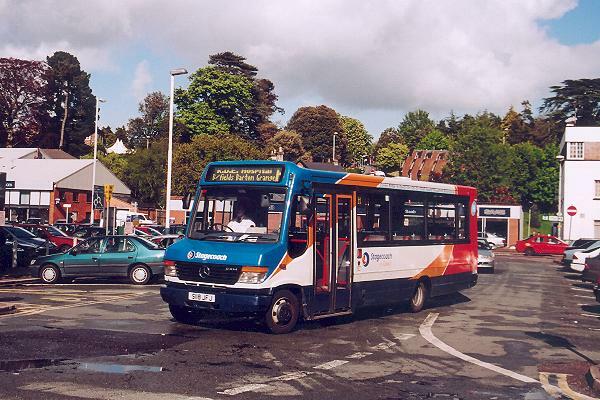 Stagecoach 59108 (M108CCD) approaching Exeter bus station in May 2003. First 2301 (M301BRL) preparing to depart Exeter for Newquay in May 2003. Much older Plaxton coaches are used on the service to Bude. Devon General 3533 (FDV824V), a Willowbrook bodied Leopard, in Exeter bus station in May 1987. 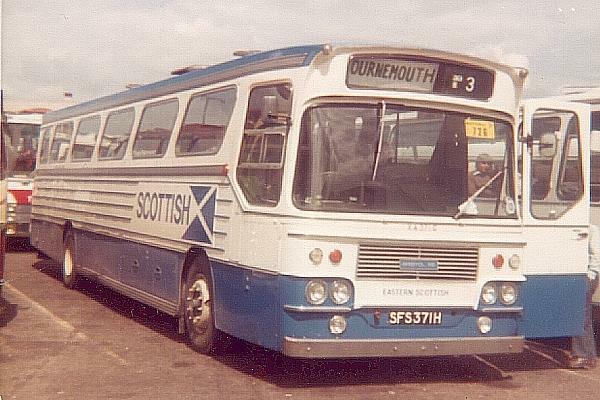 Eastern Scottish ZA371G (SFS371H), an Alexander M-type Bristol RE in Paris St. coach station in July 1978. This vehicle would have worked an overnight Edinburgh to Bournemouth service and would have been used as a National Express duplicate to Exeter. Stagecoach 33201 (WA51OSE) lettered for the Exmouth service in Exeter bus station in May 2003. Turners K892CSX and First 9059 (G803XLO) in the former Paris St. coach station in May 2003. Greenslades was the coaching subsidiary of Devon General that was sold to Hookways in the late 1980's. Their 327 (GJF507N), a Plaxton bodied Bristol LH, is seen in Exeter in May 1987. Devon General GFJ669N, a standard Leyland National I, and Western National PTT104R, a Plaxton bodied LH in Exeter bus station in May 1984. Devon General Plaxon bodied Bristol RE PUO502M in Exeter bus station in July 1978. 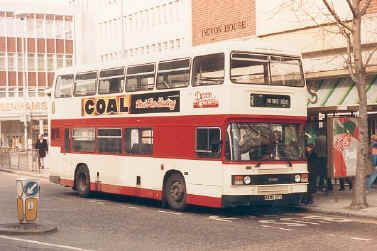 In Devon General's post-privatisation livery, Leyland Olympian A685FDV is seen in Exeter in May 1987. Stagecoach Olympian 16064 (R164VPU) (cascaded from Stagecoach East London) in Exeter bus station in May 2003. 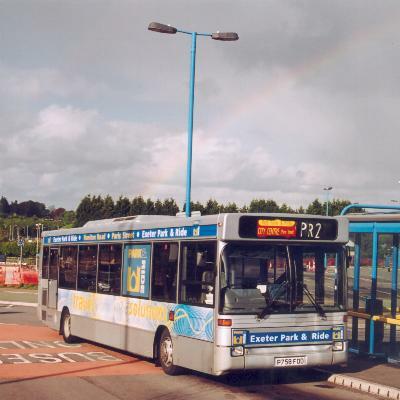 Not a pot of gold at the end of the rainbow - just an ex-Hong Kong Dart (P758FOD) on Park and Ride duty in May 2003.